The collection has been translated by Fr. Thomas Marreta.This set includes twelve large volumes, one for each month of the Church year, beginning with September. 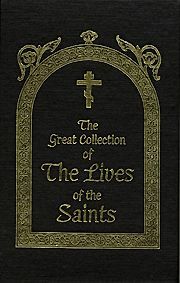 A full length, unabridged Lives of the Saints for each day of the month and homilies for the major feastdays and for certain saints by Saint Demetrius and other Holy Fathers. Each national Orthodox Church has published, in its own language, a treasury of the Lives of the Saints, not only those who flourished in the early centruies of the Church, but also those saints of that particular national church who lived during the second millennium. Typically these collections followed the same traditional structure. Our offering of the famous Russian collection marks the first time any of these collections have been published in their entirety in the English language. It is a milestone in the history of Orthodox publications in English and sure to become a standard reference work of the Orthodox saints. Hardbound. 686pp.